"Certainly it could be argued that these days I listen to too many podcasts about serial killers, and read too many crime books, and that my natural inclination towards suspicion and paranoia is therefore heightened to an eye-roll worthy degree." Thus begins the first essay in LISTEN AND BURN, the latest book from Athena Currier. The work collected in this volume is a mixture of paranoia-tinged writing, repeating patterns of pink donuts, and autobiographical comics. 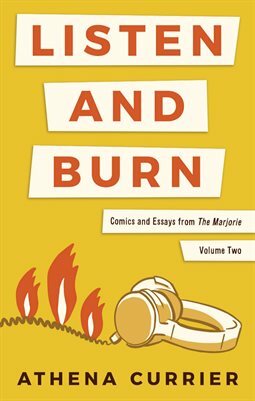 In other words, it is a good representation of what readers can expect to find on The Marjorie, Currier’s website, which has been a regular source of independent writing, comics, and illustration since its launch in 2015.